My Facebook lovefest continues. 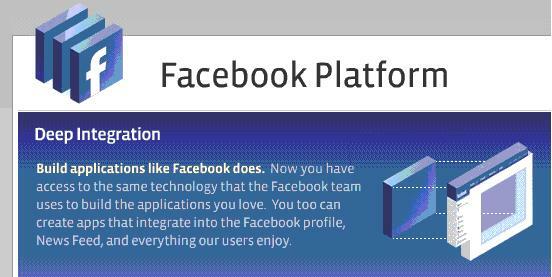 Late yesterday they announced the latest version of the Facebook Platform, which opens up the site (and its millions and millions of users) for 3rd parties to build on. If that doesn’t mean anything to you, just know this: It’s a very big deal. TechCrunch calls Facebook the “Anti-MySpace”, and for good reason. MySpace gives users the appearance of openness by letting them make their pages look as crappy as they want, but does almost everything they can to prevent users from interacting with outside sites and services. For example, when it temporarily blocked Youtube videos back in 2005, and more recently, when it blocked Photobucket content before buying them a month later. While Facebook doesn’t let users change the way pages look (one of its best features, in my opinion), it instead opens itself up to 3rd party developers with a really impressive API that’s got great documentation. Existing applications can now be integrated right into the platform so they look and feel like they’re part of the site, and entirely new apps and business ideas can (and will) be created to reach Facebook users. I love how Zuckerberg is thinking long-term with Facebook. He could have easily sold the company and cashed out, or littered the site with tons of ads, but he didn’t. Instead, he’s building a platform that will make Facebook one of the most powerful (and money-making) sites for years to come. He’s doing everything right, as best I can tell. Pure genius. Since Facebook/Twitter integration has already been done on the new platform (it’s one of the first 3rd party apps), next I’m hoping to see a Flickr application that will act as a drop-in replacement for the Facebook photo app. I’m sure someone is already working on it. It’s time for Face Book to Pay Up. The End of the Plantation system. I would like to help a bit in bringing about a new era on the Internet. We can call it web 3.0, or 2.5. I will leave the definition to others that are better at this kind of thing. This will be the era of a true revolution in the power of site members. An era where members have the power and the ability to be rewarded monetarily for the value that they add and the revenues that are generated from their work and participation. The recent announcements by Face Book that they are going to be the next OS, or the next platform, or the next goggle, reeks of egotism and self indulgence as well as a master slave mentality. In the bravado of the announcements that spewed forth from the reality distorted world of Face Book what was left out was the untold fact that Face Book would have little or no value if it were not for it’s 25 million members. Does Mr.Zuckerberg or anyone at Face Book believe that they add more value to Face Book than the 25 million members ? How much stock in the company do the 25 million members that generate hundreds of millions of dollars for Face Book own. Because the 25 million members generate most if not all of the revenue and value for Face Book, shouldn’t they all be stock owners ? It is time that members demand to be equitably rewarded (in the form of money) for the revenue and value that they generate.The 25 million Face Book members as a group should demanded to become stock holders and to be given a part of the revenue that they generate from advertisement clicks as well as a portion of the revenue that is generated from partnership deals based on their action and their numbers . If the members do make this demand and they are not rewarded in an equitable manner they should leave Face Book and any other site that will not reward equitably for the value and revenue that they generate. “Sharecropping typically involves a relatively richer owner of the land and a poorer agricultural worker or farmer; although the reverse relationship, in which a poor landlord leases out to a rich tenant also exists. The typical form of sharecropping is generally seen as exploitative, particularly with large holdings of land where there is evident disparity of wealth between the parties. [attribution needed] It can have more than a passing similarity to serfdom or indenture, and it has therefore been seen as an issue of land reform in contexts such as the Mexican Revolution. (Sharecropping is distinguished from serfdom in that sharecroppers have freedom in their private lives and, at least in theory, freedom to leave the land; and distinguished from indenture in sharecroppersentitlement to a share of production and, at least in theory, freedom to delegate the work to others.) Sharecropping is often described as a never ending cycle of debt. Sharecropping agreements can however be made fairly,[attribution needed] as a form of tenant farming or sharefarming that has a variable rental payment, paid in arrears. There are three different types of contracts. 1. Workers can rent plots of land from the owner for a certain sum and keep the whole crop. 2. Workers work on the land and earn a fixed wage from the land owner but keep none of the crop. 3. Workers can neither work for nor get paid from the land owner, so the worker and land owner each keep a share of the crop. There are three different types of tenant farming. According to A. Alkalimat, renters who were to hire land for a fixed rental to be paid either in cash or its equivalent in crop values; share tenants, who furnish their own farm equipment and work animals and obtain use of land by agreeing to pay a fixed percent of the cash crop which they raise; share-croppers who have to have furnished to them not only the land but also farm tools and animals, fertilizer, and often even their own food, which they had to pay back with a larger percentage than shared tenants. Tenant farming was a way in which to keep African Americans and other poor groups under control but make them feel like they had some importance. Though many blacks participated in tenant farming they still were looked at and labeled as the lower class. Because of the high rate of illiteracy among blacks at the time, they were often taken advantage of. Poor, illiterate and intimidated by post Civil War violence, many former slaves agreed to sharecropping contracts that were designed to keep them poor [PBS]. Eventually this exploitation led to violence. Courts would usually rule in favor of landowners when these incidents were brought to court.